Just a few miles off the California coastline, scientists have collected a strange new species of jellyfish. Four thousand feet beneath the surface of the Pacific Ocean, water temperatures hover around a chilly 37° Fahrenheit, and the tiny sparks of bioluminescent life forms provide the only light. In this dark, cold world, scientists have discovered a strange new predator - a gelatinous, blood-red jellyfish that can reach up to three meters in diameter. 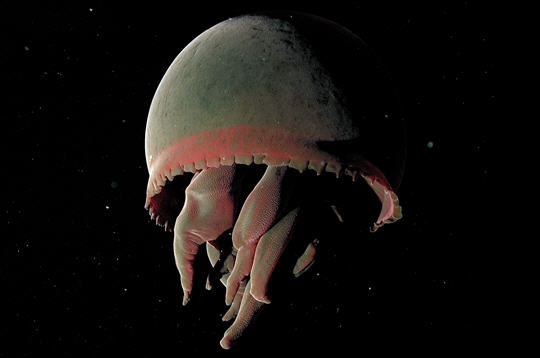 Named Tiburonia granrojo (Spanish for big red), this massive jelly is particularly unusual because it lacks tentacles, which most jellies use to catch their food. Instead, Big Red has between four and seven thick, wrinkled arms. Although the new jelly has been spotted nearly two dozen times, scientists have only been able to collect one Big Red specimen so far. This specimen - a small juvenile - has been added to the Invertebrate Zoology collection at the California Academy of Sciences, where it will be further studied. There are still many questions to be answered about Big Red, including how it reproduces, how it eats, and what it eats. Unlike many transparent jellyfish, the red pigment in Big Red's dome prevents researchers from peering into its stomach to see what it had for lunch. However, one of the most important questions has been answered - the DNA samples collected to date confirm that Big Red is not only a new species, but part of a new sub-family of jellyfish.